How do I get rid of a ‘muffin top’? 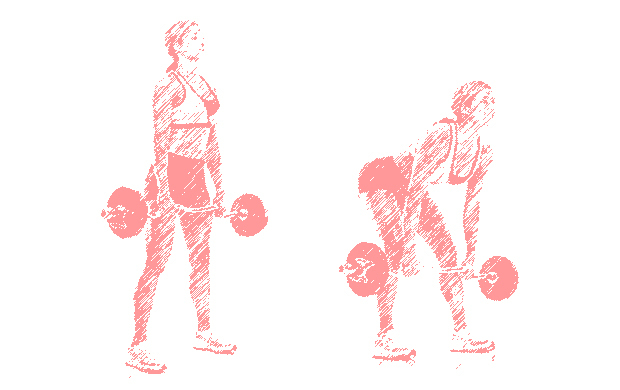 I recommend dead lifts with the long Olympic bar – a great fat-burning exercise. Put the weights on either end of the Olympic bar and place the bar on the floor. Stand with the bar above the centre of your feet – your feet should be shoulder distance apart. Grab the bar overhand so your arms are vertical to the floor. Bend through your knees until your shins hit the bar, which must remain above the middle of your feet. Keep your back long. Lift your chest but don’t squeeze your shoulder blades. Put your shoulders back and down – your head should be in line with the rest of your spine. Pull – keeping the bar close to your body, roll it over your knees and thighs until your hips and knees are locked. Do not lean back at the top. Lower the bar by pushing your hips back first, and then bend your knees once the bar reaches knee level (not before otherwise the bar will hit your knees). Repeat for five reps. The other exercise I recommend is working out the whole of the abdominals using ab mats. Lie on your back with the soles of your feet together and your knees turned out to the sides in a frog position. Stretch your arms out behind you. Keeping your back flat on the floor and stomach muscles contracted, exhale and curl your chest up a few inches off the floor and sit up to touch your toes. Lower to start. Repeat for three sets of 15 or three sets of 25.